"Leaving Brooklyn? 'Oy vey!'" 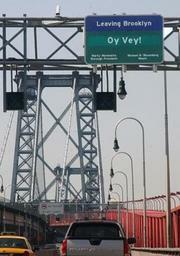 That's what motorists now see as they cross the Williamburg Bridge into Manhattan. The huge sign, affixed to a cross beam of the bridge high above the bustling traffic, is a sweet victory for Marty Markowitz, president of the borough, home to a large Jewish population. When Markowitz first approached the Department of Transportation about the sign in January 2004, he was rebuffed because the agency felt it would be distracting to motorists. After "revisiting" the issue, the DOT allowed the sign to go up two weeks ago, Markowitz said Wednesday. "I'm thrilled." Markowitz said he is responsible for many other signs praising his great borough that are posted at every entrance into Brooklyn. The DOT, he said, "saw that those signs caused no problems, and that the 'Oy vey' sign would be fine." A request for comment from the DOT was not immediately returned. "Not Just A Borough, An Experience"; "Name It...We Got It"; "Like No Other Place in the World"; "Believe the Hype." Will the "Oy Vey" sign stay up indefinitely? "I think these things are up to the discretion of the borough president," said Markowitz, managing to sneak in a plug for his re-election bid.